Rest Days 9/1/13 − 9/2/13: Enjoy Labor Day Weekend! BC Men’s Crew and I doing our first Row, Run, WOD, Run, Row on Friday afternoon! 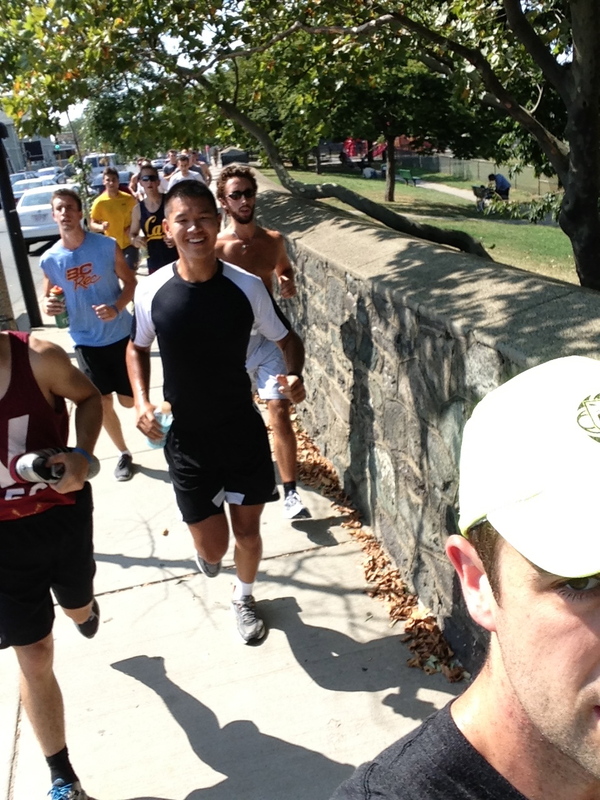 Congrats to all those that tested their 5k yesterday! It looks like there were a number of PR’s and everyone executed a solid game plan. Labor Day Weekend is a time to rest, relax, and have some fun with family and friends. With that in mind get outside and be active. Grab a friend and go a hike a mountain or hit a swimming hole. Play some golf or go for a ride. I wish you all a happy Labor Day Weekend and I look forward to hitting training hard with you on Tuesday! This entry was posted in Fitness, Motivation, Our Mission, Rowing and tagged balance life, endurance sports, exercise, health, healthy-living, inspiration, mental-health, new sport, outdoors, people, rowing, sports, training by Renegade Rowing. Bookmark the permalink.